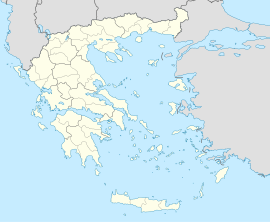 Skydra (Greek: Σκύδρα, pronounced [scˈiðra] in modern Greek, before 1926: Βερτεκόπ - Vertekop, Slavic: Вртикоп, Vrtikop) is a municipality in the Pella regional unit of Macedonia in Greece. The municipality has an area of 239.525 km2, the municipal unit 120.963 km2. In Skydra there is an ancient settlement in Mandalo. Nea Genia Skydras, plays in the fifth Division of Greece (amateur league of the Pella Football Clubs Association). In addition, Skydra has a volleyball team, Aristotelis Skydras V.C., which recently was promoted at the A2 Volleyball League. ^ a b "Απογραφή Πληθυσμού - Κατοικιών 2011. ΜΟΝΙΜΟΣ Πληθυσμός" (in Greek). Hellenic Statistical Authority. ^ "Population & housing census 2001 (incl. area and average elevation)" (PDF) (in Greek). National Statistical Service of Greece.